It’s a shame though that those moments, as brilliant as they are, will be forgotten and overshadowed by the utter lack of climax, the meandering and the self indulgence. Like Kubrick in his day, Paul Thomas Anderson is considered by many (myself included) to be the greatest working auteur. His use of the camera is unparalleled. His courage not to cut away during long closeups as well as his daring frames (there are scenes where characters are being introduced out of frame) yields a succinct experience despite the lack of actual brevity in terms of time. This is absolutely unique in Hollywood and should be celebrated, but this does not mean we all need to love everything he does. Also like Kubrick, for every 4 masterpieces, there is a Barry Lyndon (I’m a Kubrick fanatic and can admit that film is a bore) or in PTA’s case, A Master. The Master is riveting one moment, dull as a sack of wet mice the next. But this is OK, because I’m sure that Paul doesn’t see it this way. From what I know of the director, this is probably his favorite PTA film to date. However, Paul is not average and very few people I hear expressing their awe of this film are within his realm of understanding, so stop it. I believe we want geniuses making things the way they want to make them. When non geniuses mettle with the work, we are left with bad films and angry genius auteurs. That’s the worst of both worlds. He could have easily made this into a movie I would’ve enjoyed much more. Cut about 30 minutes, give me an actual ending and allow me to like Freddie a little more and bang, I’d love this movie. But he didn’t make this movie for me, he made it for himself and this pleases me greatly. OK, secretly I wish he saw things my way a little more. 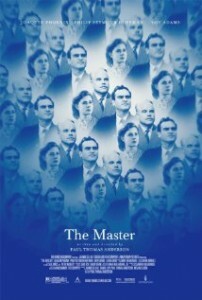 The biggest problem with The Master is that the characters aren’t Daniel Plainview. There Will Be Blood has many parallels including in depth character studies, original scores by Radiohead lead guitarist Johnny Greenwood (as well as We Need To Talk About Kevin) and both films have exceptionally overacted endings. The difference is Daniel Plainview is much more fun to hang out with and had me coming back for more (3 times in the theater alone.) Spending time with an entertaining person in a boring bar can be a great time. I have little desire to spend anymore time with drunk Freddie or cult daddy Lancaster. This is why I can not say I loved this PTA effort, but I do love the director and pray it doesn’t take another 5 years to see his next one. And no, he won’t admit that it’s about Scientology even though we can’t help but believe that it is as Scientology is the biggest alleged cult that comes to mind whenever the subject of cult is presented. Please note for the record that I said “alleged”. Posted on Wednesday, September 26th, 2012 at 11:59 am and is filed under Reviews.